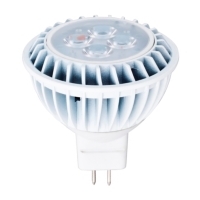 The main difference between a LED MR16, GU10, and PAR16 light is that the bases are different. Both MR16 and GU10 use pin bases that look and work differently. This is done so that bulbs do not get confused during installation. Since MR16 bulbs run on only 12 volts, they need external transformers to convert the building’s main 240 voltage supply to the 12 volts needed to run these bulbs. On the other hand, GU10 based bulbs can simply be plugged in and are ready for action. Some MR16 bulbs also come with other pin bases such as GU5.3. As far as MR16 vs. PAR16, the main difference is the size, variety, and heat. Unlike MR16 type halogen bulbs which have dichroic glass reflectors, the PAR bulbs have aluminized glass reflectors which direct the heat generated by the bulb to the front of the bulb. Because of this, PAR16 bulbs are usually not suitable for ceiling installations of 8 feet or lower. 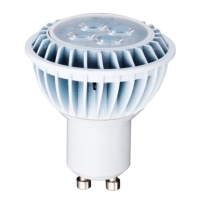 PAR16 bulbs also produce more directional yet duller lighting and have a standard, medium screw-in type of base and work in medium sized E26 sockets. MR16, on the other hand, generates heat to the rear of the bulb and produce a lot more light for the wattage because of the multi-faceted reflector (hence, MR). Although these three types of bulbs are different and should not be confused for correct installation, they will all save energy and minimize replacement and maintenance costs. Switching to any of these bulbs today can show you savings in as little as one year! ← Mogul Base Lights Bulbs: What Are They? There appears to be a 3mm (approx) difference in size at the ‘fitting’ end making it impossible to fit into current down lighter fittings. 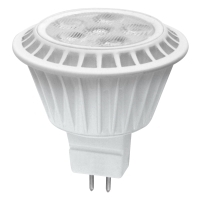 Are there any LED’s on the market that are EXACTLY the same size as Halogen GU10 bulbs? 3mm is a *large* difference. I suspect the halogen bulbs you are replacing are not really GU10 base. If it helps to know, I’ve replaced all my GU10 halogens with GreenCreative GU10 LED bulbs, and had no trouble.